BATON ROUGE, La. 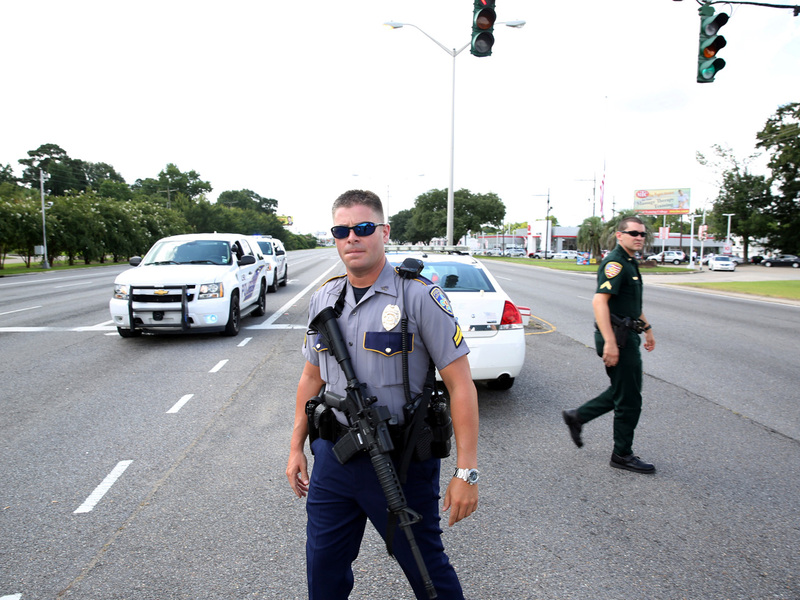 -- A deadly shooting in already-tense Baton Rouge killed three police officers and wounded three more early Sunday morning, as tensions over policing remain high in cities across the nation. Initially, police told CBS News the three wounded officers were in "very critical" condition. Hospital officials later said one was in critical condition, one was in fair condition, and one was being treated for "non-life-threatening injuries." Police say 29-year-old suspect Gavin Eugene Long was wearing all black and carrying a rifle when officers first encountered him at about 8:40 a.m. Shots were reported fired two minutes later, and the first report of an officer down came in two minutes after that. By 8:50, Long had been killed, along with two Baton Rouge police officers and an East Baton Rouge Sheriff's deputy. A military source tells CBS News that Long left the Marines in 2010 with an honorable discharge. His final Marine rank was E-5 (sergeant). Law enforcement sources tell CBS News that Long used the pseudonym of Cosmo Setepenra. He posted at least one video on YouTube about oppression and police protests. At a press conference Sunday, Louisiana Governor John Bel Edwards called the shooting "unspeakable and unjustified." "The violence, the hatred just has to stop," said Edwards. "These men risking their lives to protect and serve the community, to be taken out the way they were, they are real life heroes." Police responded to a report of officers shot at a location on Airline Highway near Old Hammond Highway around 9 a.m., reports CBS affiliate WAFB. The shooting happened near the B Quick store on Airline Highway. Coppola said that authorities believe the "scene is contained." "I do not have the extent of the injuries," Sgt. Coppola told WAFB. DeRay McKesson, a prominent Black Lives Matter activist, called for peace Sunday in an interview with The New York Times. "The movement began as a call to end violence," McKesson said. "That call remains."